The Coopered Tot: Port Charlotte PC6 - a blistering rite of passage. I'll skip the full tale. The bare bones orientation is that Bruichladdich, the Islay distillery with the highest stills and the tradition of sweeter, less peated and more floral drams, reopened under new management May of 2001 with Jim McEwan as master distiller. Bruichladdich was to continue tradition as sweet and clean so McEwan resurrected the Port Charlotte name for peated expressions. McEwan created a powerful cask strength expression with intense peat and big big flavors that startlingly broke the Bruichladdich mold when released at a young 5 years as PC5. The same distillate has been released each year, dwindling the stocks of that initial 2001 run. Each year features a distinct wood finish. 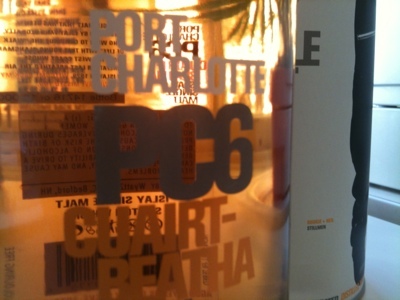 The PC5 had a bourbon wood primary aging and a sherry cask finish. PC6 had a madeira finish. PC7 was aged entirely in American oak ex-bourbon - as was PC8. This review is of the second year release PC6, bottled at 61.6% abv. Nose: Peat and iodine first, with some floral sweetness underneath. It's like smelling heather on the peat muddy moors overlooking the salt spray with a strong head wind... The peat is the turf kind - with little smoke in the nose. Almost like Caol Ila but more more more. With extended air there is more sweetness and some nutty notes. Entry is sharp as a razor and off dry. Huge explosion of honeyed malt and cereal grain body, earthy peat, salt cod, smoked kippers, sea air, and mineral rock. Spirit heat doesn't show up as pepper, but as fire and physical force within the peat. The peat is big, raw, visceral, and in your face. Magnified as a flavor element like never before in my experience I can examine every minute detail of the hot burning earthy peat as if under a gustatory microscope. It has salt and mud and coal-like bituminous notes: smoky, dirty, earthy, maritime. The cereal malt is bold, raw, organic feeling, and off dry. There's no honeyed forepalate refuge. The cereal is organic, sprouted, earthy and barley-flavored. The honeyed notes come late in the midpalate and they are far far below; as if you have to chew through the char to get to the sweet malted kernel beneath. Raw, immediate, direct and 150 decibels loud - Port Charlotte 6 screams the simplicity of its pungent humble elements with the subtlety of a B52 carpet bombing strike. Folks are either going to love this in the same way they love depression era WPA photography: dark, intense, gritty, gut wrenching reality. Or they will hate it as a dark, sooty, iodiney, insanely overproofed gastronomic ordeal. And of course it is both. For those who seek to break through their jaded complacency with pleasant malts - or those craving in-your-face terroir - PC6 delivers the goods. This isn't just a dram of whisky. This is a trial by fire. Oh my gosh... this sounds freaking amazing! Just purchased this...it was worth the chunk I had to plop down. It was intense but I was expecting even more intensity from the reviews. It had more components of just a delicious well behaved whisky than I was expecting....though let's keep some context...it was big! I think it's tamer than PC7 which is opposite of your experience...or maybe it's just superior balance makes it so drinkable. Flavors did get bigger the longer I drank it...so a little time is important here if you want the full experience. The peat and smoke during my last few sips we're coming in powerful waves. I prefer it to the 7 and it is definitely peatier. The 7 tastes younger to me...though again with context...the 7 is one of my favorite whiskies. I'll go back and re-taste and do a head-to-head with PC7. I need to review PC5 as well. I'll specifically look at which is the bigger bad boy. 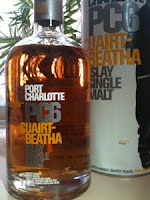 PC7 is the one that is my favorite (in my head now) - best balance between massive peat wallop and sweetness and light. Perhaps my mind played tricks on me? If so, I'm sorry. Anyway - they are all quite wonderful if you want a peat monster so it's hard to feel too bad for you.